Aircraft Carriers AND Puppets! It's not too good to be true, it's simply Kids Week aboard the Intrepid Museum in NYC. This year the festival featured a screening of Heather Henson's curation of puppetry shorts Handmade Puppet Dreams. Puppet Heap's original short film Mother Hubbard was one of the shorts selected for the viewing. Puppet Heap was happy to be apart of Handmade Puppet Dreams as always, and director Paul Andrejco, stayed afterwards to answer any of the audience's questions during the talkback. To learn more about Handmade Puppet Dreams, you can visit their website here. Looking for a wonderful afternoon of family friendly "edu-tainment"? 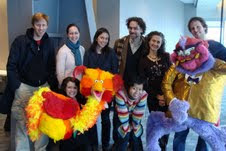 Puppet Heap recommends you stop by the Brooklyn Central Library to see Grace Chang's Chinese New Year Gala event on February 13th. Grace has a wonderful show that includes acrobats, magic illusions, live music, and puppetry. 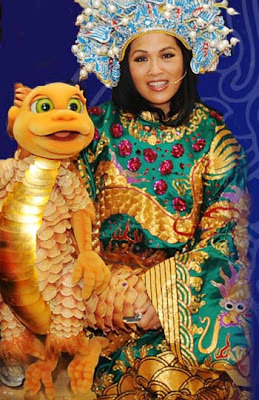 Puppet Heap was lucky enough to collaborate with Grace in the building of her magical dragon puppet named Jin Jin in 2009.